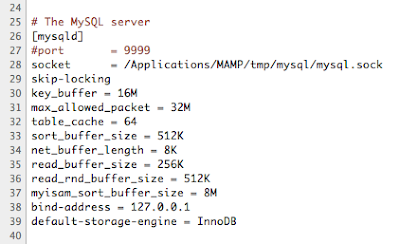 The MySQL server of MAMP and MAMP PRO uses the Default Storage Engine MyISAM. If you want to change this, you have to change the configuration file of the MySQL server. With this tutorial we want to show you how to manage this. As Default Storage Engine we are using InnoDB. Stop the MAMP Server if it is running. Use a texteditor to create a file named "my.cnf" and save it to the "/Applications/MAMP/conf/" folder. Stop the MAMP PRO server if it is running. If a warning message appears confirm with OK.
Save (Apple + S) all changes made on "my.cnf"
Start the MAMP PRO servers. How-to check if the modifications succeeded. Servers of MAMP / MAMP PRO must be running. A table with the storage Engines of MySQL will show up. Inside the Support column "InnoDB" now has the value "DEFAULT". InnoDB now is the default Storage Engine of the MySQL Server.